← Beyond the Mask Release Day Giveaway! The world of Riftmaker is populated with characters who have an unusual background. Or perhaps I should say they had a completely usual background for their species, then one day they were ripped from our plane of existence and woke up in a human body on the other side of a rift in space and time. Before Cirroc became a man and was given his human name, he lived in mountains of central Asia. Like his snow leopard brethren, he lived a mostly solitary life in the frozen drifts, hunting down prey and trying to survive. About a dozen years ago, all of that changed. The silent, white world of his mountain home became awash in purple light as a portal opened. The dazzling gash hung in the air and sang a song so beautiful, he could not help but walk toward it. As the rift enveloped him, his essence remained but his body was torn apart and reassembled in his new form; the pale blue of his eyes and the dappled silver of his hair the only remnants of his former shape. With his new body came a new and utterly malleable mind. And that’s just the way The Commander likes his recruits. Cirroc’s world expanded, new and exciting thoughts could take shape, and he became part of a community where everyone was considered a brother or a sister. The Commander, who was also the spiritual leader and teacher of The Chosen, painted a picture of how special people like Cirros were. They were closer to nature, closer to their instincts than the spoiled and haughty citizens of the clockwork city of Excelsior. But despite their superiority, they’d been relegated to living in the shadows, afraid that they would disappear at the hand of their oppressors and never return. The Commander has made powerful allies to further their cause, and assures his people that their deliverance is at hand. All they have to do is everything he says. For a decade, Cirroc has done just that, and even been promoted through the ranks. But with his expanded mind came to power to question the world order. The more questions he asks about the mission of The Chosen, the less he likes the answers. Here’s a little introduction to Cirroc and his Commander. He replaced his handkerchief, took a final deep breath, and rapped on the door. “Enter,” came the terse response. Cirroc reached for the handle, but the door was already being opened for him by a servant. He stepped a few paces into the long room and stood at attention. The Commander was standing at the other end of the room with his back to the sergeant, perusing a map on the wall. Cirroc did not need the meager light to see it, he recognized the shape of the Excelsior city walls easily, as well as the places marked as gateways for driving in the chimeras. As a keeper, he was all too familiar with these places and the Commander’s keen interest in them. The supplies they carted away through these makeshift doors every night were the lifeblood of the camp. It stung Cirroc’s pride to be kept waiting, but he also knew he was in no position to aggravate his teacher and most high commander. The more recruits they brought in, the more important discipline had become, and the Commander did not hesitate to quash anyone who strayed out of line. So Cirroc held his pose of attentive readiness and would do so until he was told to do otherwise. After what felt like an eternity, the Commander finally spoke from his dais, but still did not turn to face him. “What know you of justice?” “We know none,” Cirroc replied. “For we are those who are forgotten.” This call and response mantra was one of the first things drilled into a new recruit’s head upon entering service. Usually, the words rolled out of Cirroc without even thinking, but as their strange duet continued, he grew more uneasy. “We know none, for we are those who are provided for.” Cirroc did his best to keep his glassy stare straight ahead when the Commander finally turned and regarded him. His leonine mane was loose about his shoulders. The candlelight glinted in the depths of the Commander’s good eye. The milky white ruin of the other stood out against the dark scars that ran down the left side of his face. Will Cirroc follow orders or follow his conscience? Check out Riftmaker by Phoebe Darqueling to find out! 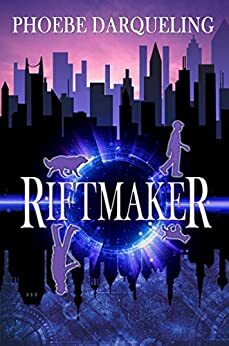 For a limited time, Riftmaker is available for $1.99 from Amazon and a variety of other e-book retailers. So grab your copy before Feb, 14! Print price is $18.99 from Amazon and the Our Write Side store. Thanks for hosting this character spotlight!